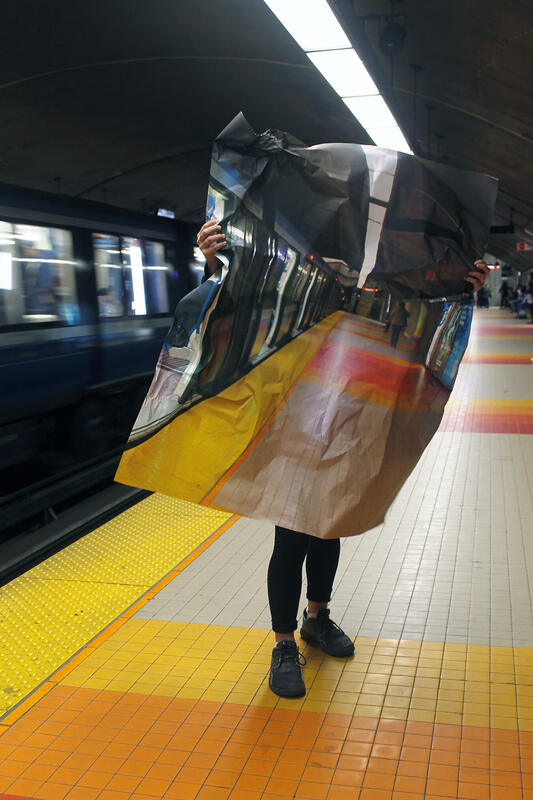 I’m a mixed media artist living and working in Montréal. I tend to work with different materials from project to project which is exciting but creates a lot of challenges. I’m always learning and problem solving in the studio – fighting with new techniques and materials, and hoping the materials sort of win in the end. I work as a studio assistant, and have a small business making and selling candles to boutiques across Canada. I feel like most of my time is spent problem solving or listening to audiobooks while working with my hands. What materials do you use and what is your process like? I like to experiment with different materials and find the best tools for the job. Consequently, I tend to work with different materials from project to project. Which is exciting but creates a lot of challenges. I’m always learning and problem solving in the studio – fighting with new techniques and materials, and hoping the materials sort of win in the end. As much as I like new materials it’s a struggle. I get super excited by an idea and just want to GO! So I’m incredibly impatient (lazy) about learning new techniques in the proper way – consequently I end up taking what seem like short cuts that end up being and incredibly round about way to a particular result (using software for 3D projects designed for 2D projects for example). Oddly enough this has become a pretty important part of my process because the results are so unexpected. I end up making a lot of discoveries this way. Of course I do sometimes watch tutorials and go to workshops, but in a strange way, as soon as you understand exactly what a tool is designed for, its harder to think of what it can do outside of that context. There is a strange way in which expertise can be limiting. In February, I’m installing my thesis show at Concordia University. The exhibition is playing with scale and dimensionality with intricate wall mounted sculptures more than 4 meters wide and 2 meters tall. I’m still very much in the process of defining things, but speaking broadly- I’m taking recognizable images and trying to make them unrecognizable, how to turn the borders that outline a nation and turn it back into an abstract shape again, for example. The way I like to think of it, is I’m doing a lot of research and reading a lot of theory in order to get as close as I can to looking at things like toddler, or an alien (toddlers are a kind of alien really). 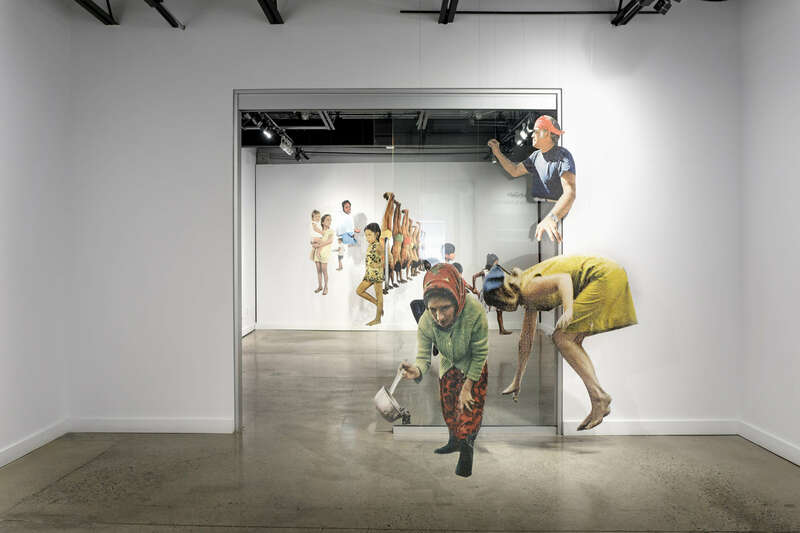 This past spring I had my first solo show Cut-Outs at Centre Never Apart, where I was able to do a full scale installation of cut outs I’d collected from cold war era National Geographic magazines. 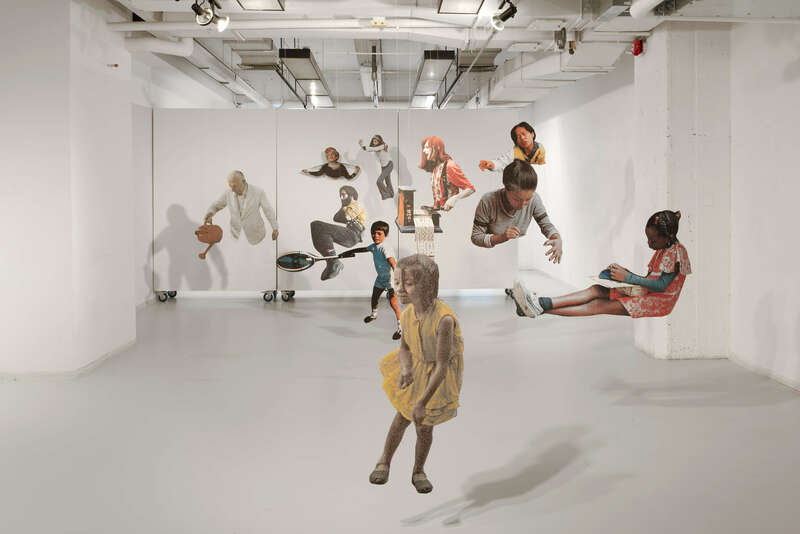 The cut outs were scanned and blown up to life size and hung in the gallery to create a totally immersive space. The series investigates how images carry the social, political, and culture values of those who create and disseminate them. As well as how collage can be used to highlight these constructions, how messages are changed as context is stripped away, and what meanings stubbornly stay behind. 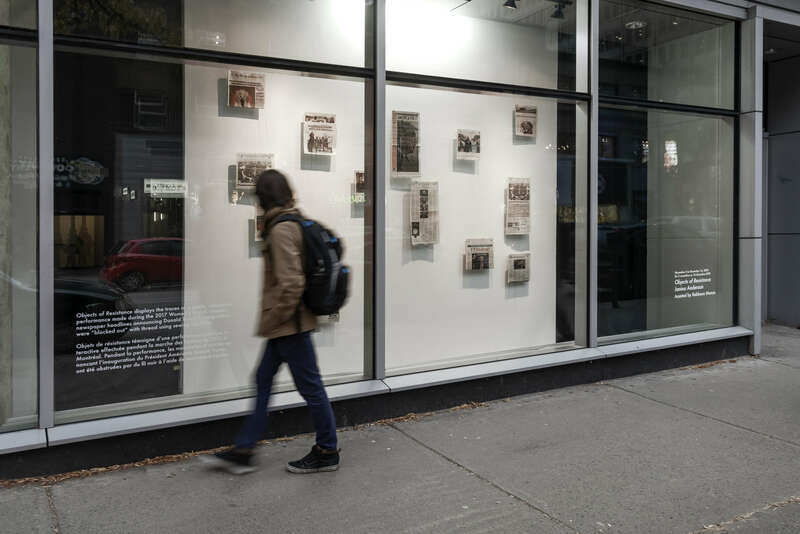 A Couple of weeks ago I de-installed a piece at the FOFA gallery here in Montréal called Blackout Newspaper. 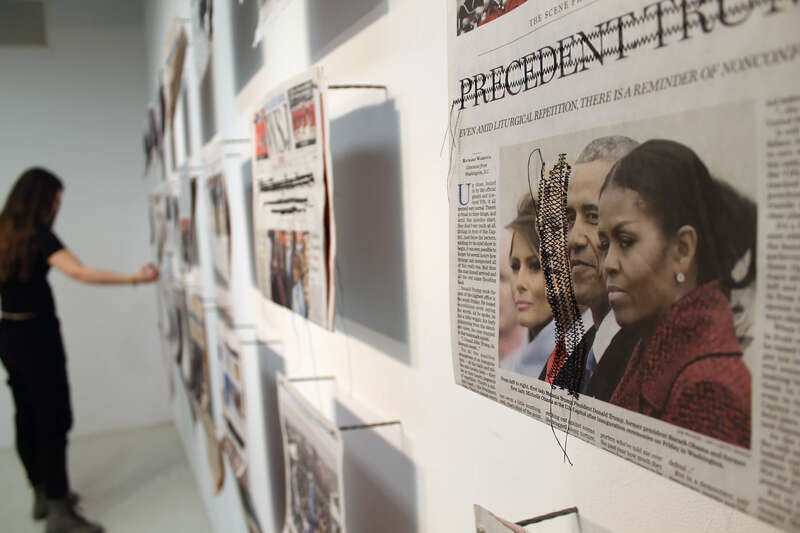 The work was a remnant from a performance piece I worked on during the 2017 women’s march, where people were invited to sew through newspaper headlines announcing Trump’s Inauguration while collecting donations for Planned Parenthood. Where do you see your practice going next, any exciting changes going on in studio? At the moment I’m pretty focused on my thesis, but I’ve also been working on a new body of photographic work called The Unseen Series. I was inspired after the Kavanaugh hearings by how blatantly a woman’s voice was silenced. A lot of people, including myself, saw that and recognized their own experience. In the days that followed I started making portraits of survivors holding a photograph depicting the space directly behind them, effectively covering them up, while making the process of covering painfully clear. The work uses photography’s blend of artifice and it’s perceived relationship to “fact” to discuss the process through which the stories and experiences of sexual assault survivors are rendered invisible. What is it like living and working in Montréal? What is your favorite part about the community there? Because I’m an MFA student at Concordia, my creative community is much more rooted in the university than the city itself, so I’m hesitant to speak generally about the art community outside the institution and the MFA specifically. However, there are a lot of great galleries and artist run spaces here, and because the Canadian and Quebec governments are much better at supporting the Arts than their American counterparts, there are more opportunities for exciting work without the pressure to be commercially successful. As vague as it sounds, I’d really love my viewer to come away with what they need to come away with. My work isn’t really about providing any kind of answer, the thing I’m after is how to ask a better and better questions. Each set of tools, each project, each opportunity, is a chance to refine my questions. In this way, I don’t need the viewer to understand the exact set of circumstances that brought me to the question; instead, I’m hoping the work helps them ask questions relevant to their own life and experience. Where is your favorite place in the world to be? 1. Flipping the lights on in the studio, at the beginning of a long workday, with something electric on the wall. 2. With my family, if everyone is (at least sort of) getting along. 3. In bed, after everything is done, and so am I. 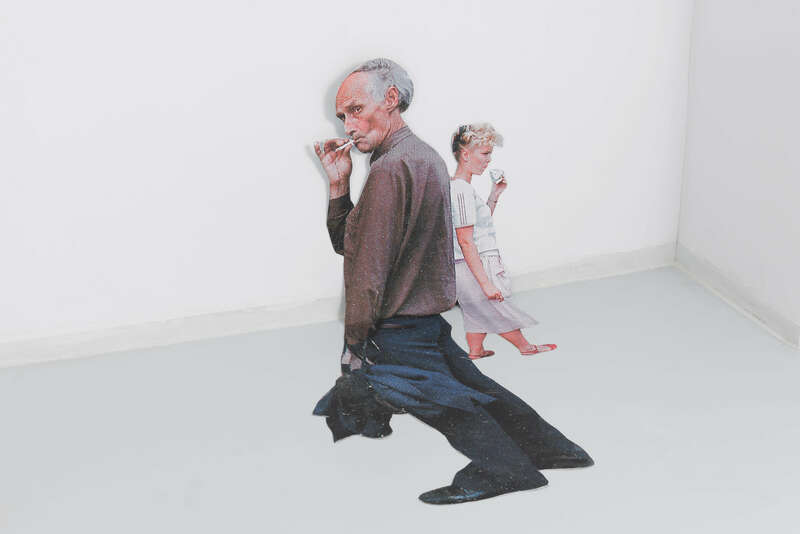 Too many to name, but right now I’m looking at: Rachel Whiteread, John Baldessari, Douglas Gordan, Janine Antoni, Sarah Lucas, Judith Henry, Jessica Stockholder, Dustin Yellin, Franz West, Gabriel Orozco, Felix Gonzalez-Torres, Sophie Calle, and Issa Genzken.